The long, arduous ballad of Rodney Stuckey is finally coming to a close. Entering his seventh season, Stuckey hasn't lived up to the expectations the Pistons' brass had for him when they drafted him 15th overall as a versatile combo guard. In the last season of his current contract, Stuckey may have something to prove or perhaps he just wants to reconcile for the worst season of his professional career. What we do know is that the drafting of Kentavious Caldwell-Pope and signing of Chauncey Billups, Stuckey's game minutes and time left in a Pistons jersey are both probably approaching zero. Last season, Stuckey saw his minutes stay relatively steady but his efficiency stats drop noticeably from previous years. This could be due to how bad Detroit was last season or just an indication of the final gasp of life in Stuckey's career. Playing in a contract year may be a revelation for Stuck, but even still, he's likely not long for this team. Mo Cheeks recently said that KCP is not in the running for the starting SG spot: Something something veterans something something. This will only hold so long as KCP continues to shoot as poorly as he has in the summer league and the first preseason matchup. The starting offense will struggle with Stuckey's inability to stretch the floor, pushing him to the bench in favor of either Chauncey or KCP. Stuckey, like Villanueva and Jerebko, is a prime trade candidate because of his expiring contract. But it's also likely that a semi-contender thinks to itself "I really want a B- version of Shannon Brown" and tries to acquire him. Stuckey likely gets significant minutes until KCP settles into his role on the team. What does this mean for the team? Stuckey's name gets added to the long list of players that the Pistons could potentially (and likely will) deal. With his relative good standing with the organization--especially Chauncey's affinity for him--Stuckey remains the least-likely of any of the trade bait contracts to get shipped off. 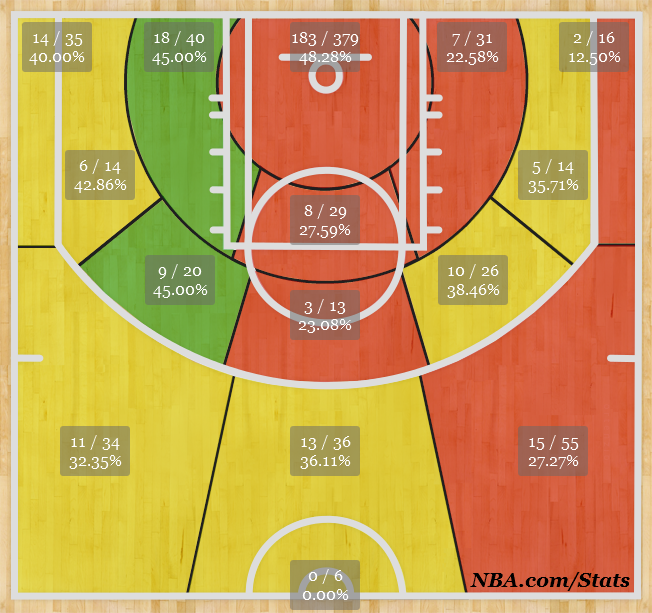 The development of KCP will go a long way toward determining if Stuckey is around at season's end. Until then, Stuckey can only be effective with floor spacers on the court. Inserting him into the starting lineup will only compound the spacing issues the team is facing. If he is around after the season's conclusion, expect a small veteran-level contract to keep him around for the next year or two.